The Martindale-Hubbell Peer Review is the gold standard when rating lawyers. Attorneys chosen for the Martindale-Hubbell have been recognized by this century-old rating for their ability to meet clients legal needs and have consistently reached the top-echelon of the country’s jurisprudence. Nick Wooldridge achieved these peer review ratings by undergoing a comprehensive review of an his legal abilities as seen through the lens of both clients and attorneys. Avvo’s acknowledgment was established as the ultimate tool for finding experienced, qualified lawyers in a variety of niches. Mr. Wooldridge’s inclusion as an Avvo-listed lawyer assures potential clients they are getting the best in prescreened lawyers who can meet the needs of discerning clients. Super Lawyers is a rating service of outstanding lawyers from more than 70 practice areas who have attained a high-degree of peer recognition and professional achievement. Nick’s selection occurred after independent research, peer nominations and peer evaluations. 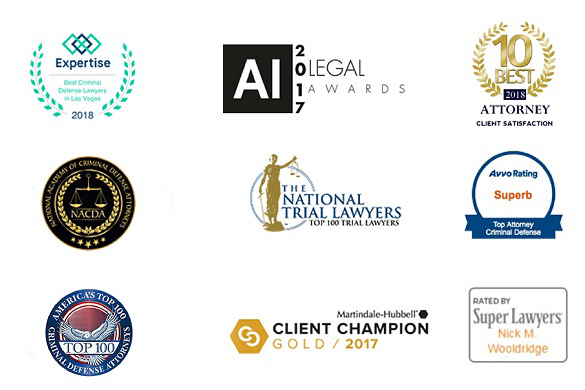 The National Trial Lawyers is a professional organization composed of the premier trial lawyers from across the country. Nicholas Wooldridge exemplifies the superior qualifications as criminal defense trial lawyers which are required for acceptance. The Top 10 Criminal Defense Attorney designation, granted by National Academy of Criminal Defense Attorneys, provides the public with accurate, up-to-date information about qualified criminal defense lawyers nationally. Mr. Wooldridge was selected from a narrow field for this award. Founded in 1999, Board Certification by NCDD recognizes attorneys who exemplify the program’s standards and meet established criteria by the Board of Regents. Nw’s lifetime achievement, quality of service and client compassion put him in good stead to receive this award. Recognition by the National Association of Criminal Defense Lawyers, the premier organization in America for the nation’s criminal defense attorneys, means that Mr. Wooldridge has a lifetime of distinguished leadership and service on the law’s behalf, an honor he gratefully accepts. Inclusion in the Top 3 Criminal Defense Lawyers in Las Vegas, NV follows a 50-point inspection which reviews reputation, history, local reviews, trust and cost.